Electric Griddles have been seen to replace the traditional stovetop pans largely because of their convenience. Usually, in terms of filling up space in the kitchen, these pretty much resemble the stovetop burners but it does provide a larger area for cooking. An electric griddle mainly works like a large pan which can be used to cook food or to keep the food warm. And Companies like Presto are taking Griddles to the next level with quality, so here we are listing some of the best presto electric griddles that you can buy this year. This is a super-sized electric griddle from Presto and are best suited for cooking any type of meals. They are known to cook 50% more than the jumbo electric griddles. The key features of this electric griddle are as follows. It comes with a non-stick cooking surface which is very easy to clean. It also features a slide out drip tray that can be emptied very easily. It is fully submersible with the removal of heat control. It comes with the Control Master heat control that automatically maintains the right cooking temperature while cooking. It features a very large cooking surface which is ideal for cooking as many as 12 French toasts in one go. It operates at 120 Volts and 60 Hz only. It is made up of heavy cast aluminium base. It comes with a built-in backstop ledge which makes food handling really convenient. It comes with a special Tilt’nDrain feature that allows us to adjust the griddler easily according to the situation. For example, while cooking eggs it can be kept flat and while cooking meat, it can be slightly tilted to make a draining surface. It can be tilted by simply pulling the handles outwards and readjusted to the original one by pushing the handles back in. The overall dimensions of this electric griddle are 23.94 x 5.12 x 18.5 inches. The total weight of this electric griddle is 8.45 lbs. It comes in black colour. This is an Electric griddle from Presto that offers a large cooking surface area for cooking enough pancakes and burgers for a large crowd indoors. The key features of this electric griddle are as follows. It has been proportioned into a 22 by 11-inch cooking surface area. It comes with a smoother and more professional grade non-stick finishing. It requires minimum use of grease while cooking because of the non-stick cooking surface that prevents food from sticking onto it. It features a groove along one side that channels grease drips through a small hole into a sturdy plastic container that slides completely out for cleaning while making fattier bacon or meat. It comes with removable heat control which makes it easy to fully submerse in warm or soap water. It is a 1500-watt griddle that plugs into a 120 V outlet. It is capable for maintaining temperatures automatically from warm to 400 degrees F.
It is made up of heavy duty cast aluminium that that is responsible for even heat distribution and resisting warping. It comes with a Control Master heat control that is responsible for maintaining desired cooking temperatures automatically. It also has a slide out drip tray that can be emptied and cleaned easily. The overall dimensions of this electric griddle are 26.5 x 14.3 x 4.8 inches. The total weight of this electric griddle is 7.14 lbs. This is an extra-large electric griddle that is capable of cooking a whole meal for the complete family. It makes stick-free cooking and warming very easy. The key features of this electric griddle are as follows. It features detachable handles which makes it easy to store. To remove the handles, simply open the latch clips and they will be detached. It can be stored in standard 18-inch kitchen cabinets with the handles removed. It comes with a premium textured cooking surface that provides enhanced non-stick cooking experience and cleans easily. It is fully submersible with the heat controls removed. It operates on 120 V AC, 60 Hz only. It comes with a slide out drip tray that can be easily removed, emptied and cleaned. It comes with the Control Master that maintains the desired cooking temperature automatically during cooking. The overall dimensions of this electric griddle are 26.25 x 11.5 x 2.5 inches. The total weight of this electric griddle is 6.5 lbs. 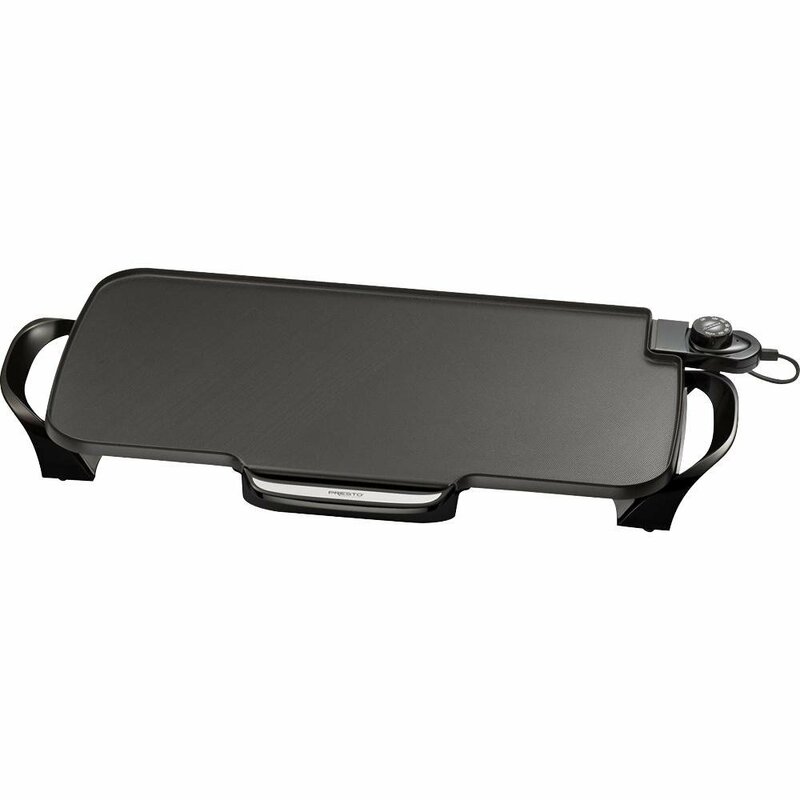 Making breakfast meals, specially pancakes and French toasts and meats is very much easy with the electric griddle. Most of it is because of the even heat distribution all over the large cooking surface area which is also non-stick and offers total flexibility in setting temperatures as required by the cook. All it requires is an electricity plug and it is ready to cook like a pro. However, an electric is bulky and large sized, but there are variations available in sizes too. You can choose a comparatively smaller electric griddle according to your countertop area. Besides cooking, these electric griddles prove great in keeping the food warm. Some of these have a warming tray that goes beneath the cooking area and can be used as a food warmer. The temperatures on the electric griddle are completely adjustable too. Some of these also come with automatic heat adjust system that makes it versatile for all kinds of pan foods. For greasy food stuff, too, it is ideal since it can collect all grease drips through the ringed edges. For cooking non-stick foods, this can be one the best go to appliance that would provide immense efficiency and a great overall cooking experience.